Machine vision inspection equipment is mainly used for quality inspection in industrial products. Compared with human inspection by naked eye detecting, machine vision inspection equipment can be used to accurately and quickly distinguish defective products and qualified products. The accuracy rate almost reaches 100%. It helps increasing production yields at he same time effectively guarantee the quality of the products. Machine vision inspection machine is an important and indispensable equipment for modern industrial production. It is widely used in various kind of fields. So it brings to the question. What are the classifications of Machine vision inspection? Let’s find them in the following description. Machine vision inspection is currently divided into 3 main categories, Main function, Detection technology and Installation carrier. According to function, machine vision inspection is classified as, Positioning, Defect inspection, Dimension measurement, Counting/missing detection, Feeding and etc. 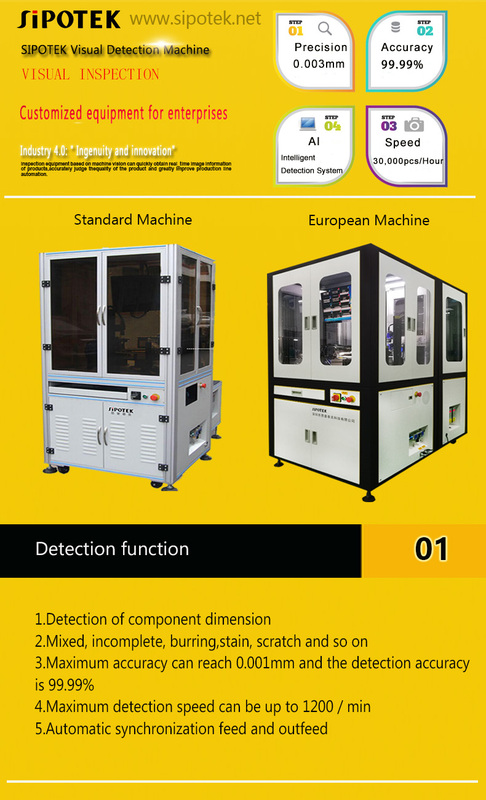 According to detection technology, machine vision inspection is classified as, Three-dimensional machine detection technology, Mottled detection technology, Scale measurement technology, OCR technology, Color recognition technology and etc. According to the carrier of its device, there are Online camera vision inspection system and offline detection system. Machine vision inspection equipment is non-contact, high precision and automatic. Compared to general image processing system, machine vision emphasized the accuracy and speed, as well as the reliability in industrial on-site environment. Machine vision inspection is suitable for measurement, detection and identification in the process of massive production. For example, part assembly integrity, assembly dimensional accuracy, part processing accuracy, position or angle measurement, part identification, features or word recognition, etc. In almost every industry, machine vision detection technology is widely used and applied, which brings us a huge market development space in the future.